Preheat oven to 350˚F with rack in middle. Generously butter a glass or ceramic baking dish. You can rub it with a clove of garlic if desired. Put bread on a sheet pan and bake until just dried out, about 10 minutes. Heat 1 tablespoon of oil in a large skillet over medium-high heat until it shimmers, then cook half of the sausage, stirring and breaking it into small pieces, until golden brown, about 6 minutes. Transfer with a slotted spoon to a napkin-lined plate to drain. Pour off the fat from the skillet and wipe clean. Heat butter over medium heat until foam subsides, then cook the onions, celery, garlic, and ½ teaspoon each of salt and pepper, stirring occasionally, until golden, about 12-15 minutes. Add vegetables and bread to sausage. Whisk together eggs, ½ cup of cream, turkey stock, cheese, parsley and thyme, then stir into stuffing and cool completely, about 30 minutes. Drizzle remaining ¼ cup of cream over, cover and stuffing with foil and chill. 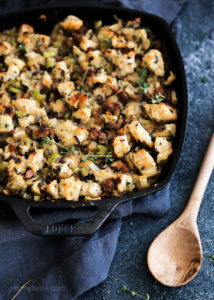 1 hour before dinner starts, bring dish of stuffing to room temperature. When your turkey is done and out of the oven, increase temperature of oven to 425˚F and bake stuffing, covered tightly with foil, until hot throughout, about 20 minutes. Remove foil and bake until top is golden and crisp, about another 15 minutes longer.